Continuing our series of articles concerning proposed practices while working with the Java programming language, we are going to perform a performance comparison between the three probably most used Collection implementation classes. To make things more realistic we are going to test against a multi–threading environment so as to discuss and demonstrate how to utilize Vector, ArrayList and/or HashSet for high performance applications. All discussed topics are based on use cases derived from the development of mission critical, ultra high performance production systems for the telecommunication industry. Prior reading each section of this article it is highly recommended that you consult the relevant Java API documentation for detailed information and code samples. One of the most common tasks a Java developer has to implement is storing and retrieving objects from Collections. The Java programming language provides a handful of Collection implementation classes with both overlapping and unique characteristics. Vector, ArrayList and HashSet are probably the most frequently used. Nevertheless working with Collection implementation classes, especially in a multi–threading environment, can by tricky. The majority of them does not provide synchronized access by default. As a consequence, altering the internal structure of a Collection (inserting or retracting elements) in a concurrent manner will certainly lead to errors. The case scenario that will be discussed here is having multiple Threads inserting, retracting and iterating through elements of every Collection implementation class mentioned above. We are going to demonstrate how to properly utilize the aforementioned collection implementation classes in a multi–threading environment and provide relevant performance comparison charts so as to show which one performs better in every test case. At the end of each test run every Collection implementation class will be populated with 5000 distinct String elements. 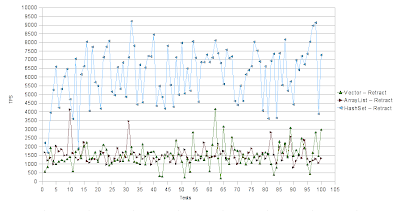 The horizontal axis represents the number of test runs and the vertical axis the average transactions per second (TPS) for each test run. Thus higher values are better. As you can see Vector and ArrayList Collection implementation classes performed almost identically when adding elements to them. On the other hand the HashSet Collection implementation class presented a slightly inferior performance mainly due to the more complex internal structure and the hash generation mechanism. For the second test case we are going to have multiple Threads removing String elements from each Collection implementation class. All collection implementation classes will be pre–populated with the String elements from the previous test case. For removing elements we will be utilizing a shared Iterator instance among all worker Threads for each Collection implementation class. Synchronized access to the Iterator instance will also be implemented. Every worker Thread will be removing the next available element of the Collection implementation class, issuing the “next()” and “remove()” Iterator operations (to avoid ConcurrentModificationException). 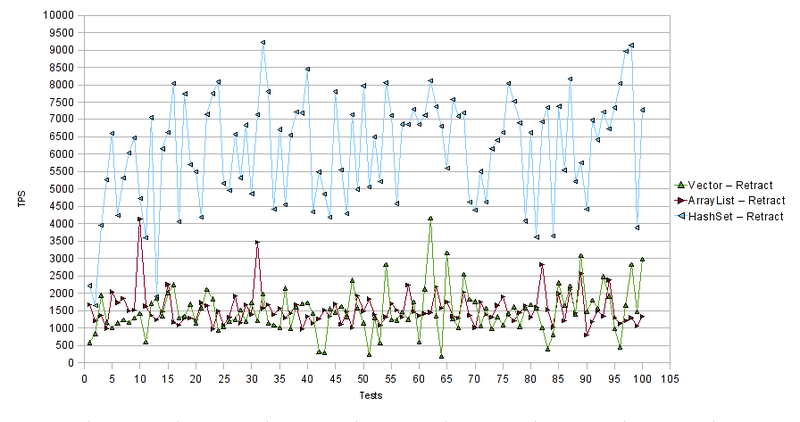 Below is the performance comparison chart for the aforementioned test case. 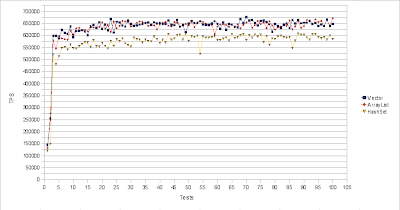 The horizontal axis represents the number of test runs and the vertical axis the average transactions per second (TPS) for each test run. Thus higher values are better. Again both Vector and ArrayList Collection implementation classes performed almost identically when removing String elements from them. On the other hand the HashSet Collection implementation class outperformed Vector and ArrayList by far, resulting in 678000 TPS on average. At this point we must pinpoint that by using the “remove(0)” method of Vector and ArrayList Collection implementation classes to remove String elements, we have achieved slightly better performance results compared to utilizing a synchronized shared Iterator instance. The reason that we have demonstrated the synchronized shared Iterator instance “next()” and “remove()” operations approach is to maintain a fare comparison between the three Collection implementation classes. For that reason we will conduct this test again, removing the last element from Vector and ArrayList Collection implementation classes since we presume that the order of elements in the Collections is of no importance. The performance results are show below. 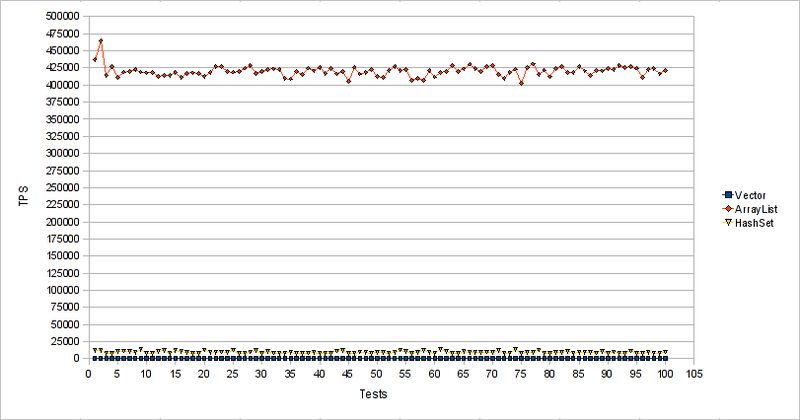 The horizontal axis represents the number of test runs and the vertical axis the average transactions per second (TPS) for each test run. Thus higher values are better. As expected all Collection implementation classes performed almost identically when removing String elements from them. For the third test case we are going to have multiple worker Threads iterating over the elements of each Collection implementation class. Every worker Thread will be using the Collection “iterator()” operation to retrieve a reference to an Iterator instance and iterate through all the available Collection elements using the Iterator “next()” operation. All Collection implementation classes will be pre–populated with the String values from the first test case. 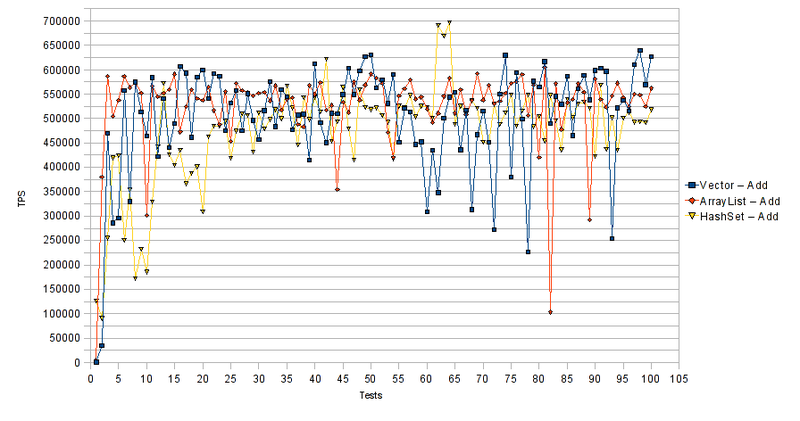 Below is the performance comparison chart for the aforementioned test case. 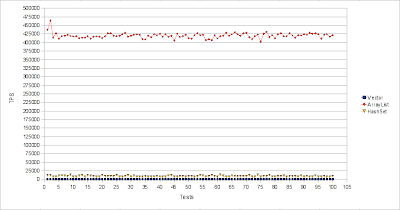 The horizontal axis represents the number of test runs and the vertical axis the average transactions per second (TPS) for each test run. Thus higher values are better. Both Vector and HashSet Collection implementation classes performed poorly compared to the ArrayList Collection implementation class. Vector scored 68 TPS on average, while HashSet scored 9200 TPS on average. On the other hand the ArrayList outperformed Vector and HashSet by far, resulting in 421000 TPS on average. For our final test case we are going to implement the combination of test case #1 and test case #2 scenarios. One group of worker Threads is going to insert String elements to every Collection implementation class, whereas another group of worker Threads is going to retract the String elements from them. We should start the “controller” task prior starting the worker Threads that write to and read from the relevant HashSets. 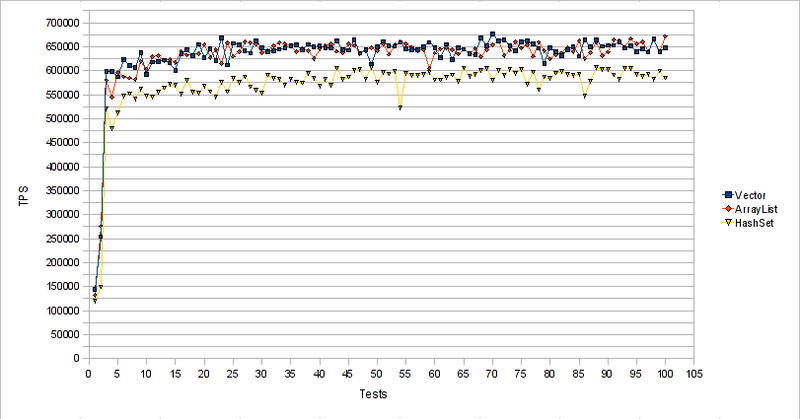 Below is the performance comparison chart for the addition part of the aforementioned test case. 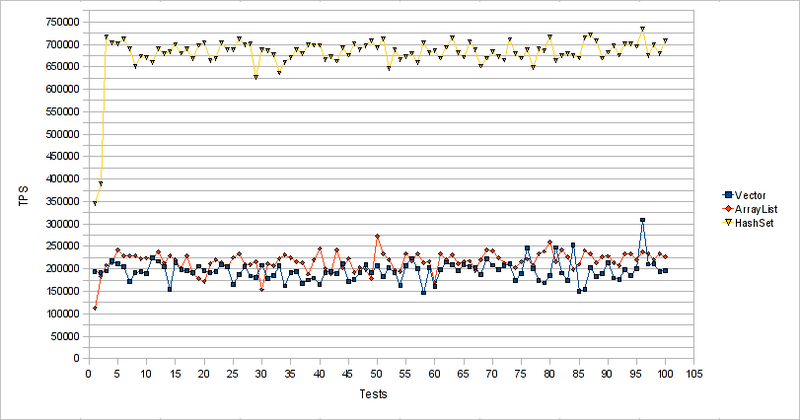 Following is the performance comparison chart for the retraction part of the aforementioned test case. 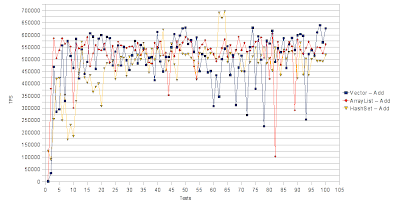 The horizontal axis represents the number of test runs and the vertical axis the average transactions per second (TPS) for each test run. Thus higher values are better. Both Vector and ArrayList Collection implementation classes performed almost identically when adding and retracting elements from them. On the other hand for the element addition test case our proposed implementation, with the “adding” and “retracting” HashSet pair, performed slightly inferiorly compared to Vector and ArrayList implementations. Nevertheless for the element retraction test case our “adding” and “retracting” HashSet pair implementation outperformed both Vector and ArrayList implementations by far scoring 6000 TPS on average. 6 Comments Views Tweet it! Hey Justin, this is great work and very helpful! The only pity is that you did not include the other three Collections LinkedList, LinkedHashSet and TreeSet in your statistics. Could you add them or provide the tests source code so one can reproduce your findings? A really nice one. Really helpful. But still the question remains, should list and set be compared in this way, or should there be other things that need be considered to make these two comparable.